Wild grapes contain a huge variety of yeasts that can inhibit grape molds, and offer an eco-friendly alternative to chemical pesticides. Researchers have discovered that wild grapes host a huge array of yeasts that can inhibit common grape molds, while they found a smaller number of effective yeasts on farmed grapes. Strikingly, one strain of wild grape yeast was more effective than a pesticide at preventing common molds, suggesting that it could be an eco-friendly alternative to chemical pesticides used in agriculture. The study was recently published in open-access journal Frontiers in Microbiology. Plants are a hugely important part of what we eat, forming over 80% of the human diet. However, fungal diseases, such as those caused by common molds, make growing and storing food a challenge. Researchers estimate that in developing countries, fungal plant decay results in crop losses of up to 50%. To add insult to injury, some of these fungi produce toxins that are harmful for humans. So, how can we win the battle against disease-causing fungi? At present, many farmers use chemical pesticides to control fungal diseases. However, this comes at a price. Pesticides leave hazardous residues in the environment that can have significant impact on local ecosystems. In addition, traces of pesticides can end up in food, and could affect our health. Finally, many fungi are becoming resistant, meaning that pesticides may not work effectively. The European Union has restricted certain pesticides, meaning that the race is on to come up with eco-friendly alternatives. One possibility is to use natural yeasts, themselves a type of single-celled fungus, to inhibit disease-causing fungi in crops. While using fungi to stop fungi seems counterintuitive, microbes like yeasts often compete with each other, and they can naturally produce substances to kill or slow down their rivals. Harnessing these fungi could provide an eco-friendly alternative to hazardous pesticides. However, so far, researchers have not been able to find yeasts that are as effective as chemical pesticides. So, where can we find useful yeasts to help with pest control? “The ‘wild’ environment represents a huge and largely untapped source of biodiversity, which could provide a reservoir of helpful microbes for pest control,” says Ileana Vigentini, a researcher at the University of Milan. 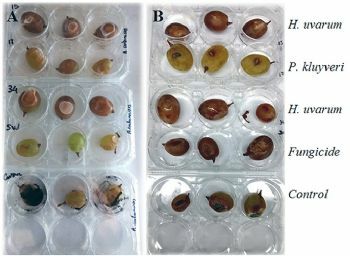 Gustavo Cordero-Bueso, Vigentini and colleagues investigated whether yeasts isolated from the skins of wild or farmed grapes could inhibit three common molds that can ruin grape harvests. Initially, the research team isolated and identified yeasts from a type of wild grape in Georgia, Italy, Romania and Spain, and farmed grapes from vineyards in Italy. In the lab, the team tested if the yeasts could inhibit the growth of the molds in petri dishes. They identified the top 20 yeasts with the most potent anti-mold effects. Of these, a whopping 18 strains came from the wild grapes, suggesting that wild plants could be a promising reservoir for useful microbes. Strikingly, one yeast strain was more effective than the chemical pesticide at preventing mold growth. Previous work has shown that this yeast strain does not interfere with wine fermentation, and can survive harsh conditions. This might make it well-suited as a biocontrol agent in vineyards, but outdoor trials are needed to confirm this. “We plan to test some of these yeast strains as a substitute for chemical pesticides in field trials using grapevines,” says Vigentini.